CMS also corrected the error in the RVU values for psychiatric diagnostic interview that resulted in a lower value for an initial visit provided by psychiatrist. For 2014, the RVU value for code 90791 for non-physicians will be decreased to 3.74 and the RVU value for code 90872 (psychiatric diagnostic interview with medical services) was increased to 4.03. There were slight decreases in the RVU value for code 90838, the 60 minute psychotherapy session, and also small decreases in the total RVUs for the office E/M codes due to reductions in the practice expense component of the RVU. CMS also refused to assign any value to the new CPT code 90863 intended to be used by psychologists with prescribing authority inLouisianaandNew Mexico. 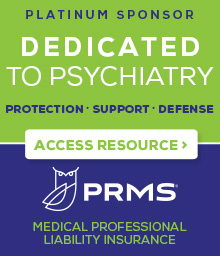 CMS stated that it was declining to assign any value to this service because “pharmacologic management services requires some know and ability to furnish E/M services” and psychologists inLouisianaandNew Mexico“remain unlicensed and unauthorized by their state to furnish E/M services.” This language should provide powerful arguments for psychiatrists in those states struggling with efforts by psychology to secure prescribing authority. Although RVU values for almost all psychiatrists’ services have substantially increased, Medicare Part B is once again facing the annual SGR crisis that threatens a precipitous drop in all Medicare fees because of a mandatory decrease in the Medicare Part B conversion factor. Once again, all physicians will await action by Congress to prevent a cut in fee in excess of 25%. Legislative proposals have been introduced to correct the SGR problem, but as in the past, final resolution remains uncertain. 1 CPT codes and descriptors only are copyright 2013 American Medical Association. All Rights Reserved. Applicable FARS/DFARS apply.